Church Mutual's policyholders know volunteers help make the world go 'round, and the latest numbers prove it! In fact, 69.9 million volunteers provided 7.9 billion hours of service in 2015, according to the Corporation for National & Community Service. 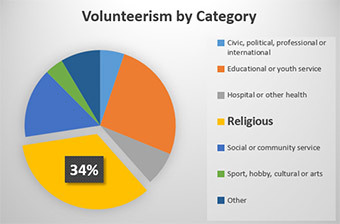 Of the 7.9 billion hours of service, 34 percent was dedicated to religious service. With volunteers playing such a large role in religious organizations, it is important that houses of worship return the favor and ensure their volunteers are safe and well managed while working to serve the greater good. Establish a coordinator: Managing and organizing volunteers can be a difficult task. Appoint a coordinator who can focus his or her efforts on the many aspects of managing volunteer labor. Background screening: All volunteers working with youths, or who are entrusted with access to your organization's money or financial information, should undergo background screening. All volunteers should submit a formal volunteer application and agree to a background check (if needed). Request a signed Indemnity and Release form from all volunteers (including youths). Match work with ability and skill: Volunteers are often eager to help out any way they can. Although enthusiasm is always appreciated, volunteer organizers should encourage volunteers to work within their means. Ability: Volunteers who overextend themselves are more susceptible to injury. Consider attributes (such as physical ability), which may be necessary to complete a task, and delegate work accordingly. Skill: When assigning tasks, ensure volunteers are equipped with the proper skills and training needed to complete their jobs. This may include providing instructions for using power tools and guidance on what to do if there is an accident. If a task requires specialized skills, hire a professional if needed. Ensure equipment is up for the job: Consider the equipment needed to complete a task efficiently and safely. Equipment: Protect your volunteers by making sure tools and equipment are in good repair. Ensure safety guards are in place, ladders are inspected, and more. Personal Protective Equipment: Personal protective equipment and first aid supplies should be made available as needed. Safety goggles, gloves, hearing protection and hard hats may be necessary to prevent accidents. A well-stocked first aid kit should be provided to quickly treat injuries. Inclement weather can increase the risks associated with volunteer work. Postpone outdoor work if threatening weather is predicted, and be mindful of sunburn and heat-related illness during hot summer days. Volunteer coordinators should not ignore safety concerns or management considerations for indoor volunteers – hazards can occur anywhere. Slips, trips, and falls are a leading cause of injury for volunteer workers. Help volunteers avoid injury by maintaining your walkways and stairs, installing safety mats and recommending non-slip footwear. Ergonomics is an important aspect of your volunteer safety procedures. Prevent strains from lifting and poor desk positioning by improving workstation ergonomics. Volunteers working in the kitchen can face special hazards. Help them prevent injuries from burns, cuts and punctures by training kitchen volunteers on safe procedures for using the stove and other kitchen equipment. Water and other spills can make floors slippery and lead to an increased risk of slips and falls. Non-skid mats are especially important in the kitchen. Also encourage volunteers to clean-up spills immediately. Extra attention should be paid to the safety and management of volunteer drivers and youth volunteers. Safe drivers should be selected to serve as a volunteer driver. Conduct background screening and check motor vehicle records as part of your selection process. If drivers will operate their own vehicles, ensure they carry personal auto insurance. Drivers should be trained on safe driving practices. Ensure drivers adhere to basic practices such as buckling seatbelts and refrain from using their phone while driving. Also consider requiring the completion of a defensive driving class. If drivers are being asked to operate a 15-passenger van, ensure they are aware of the risks and hazards of driving a larger vehicle and are experienced enough to do so. Ensure all vehicles being used are well maintained. Establish a maintenance checklist to ensure road worthiness. Youth volunteers: Special consideration must be paid when managing youth volunteers. Consider any youth labor implications that might apply such as work permits, working hours and any age restrictions regarding hazardous tasks. Take extra care to ensure youth volunteers are working in a safe environment and are well managed. If you have additional questions, or need help with volunteer safety and management, call our Risk Control Consulting and Research Center at (800) 554-2642, ext. 5213, or email riskconsulting@churchmutual.com. Our Claims Center is here to help! To report a claim, call (800) 554-2642 and select Option 2, or email claims@churchmutual.com.